Perfect night. This is the term that a fight club uses when every fighter in their team wins all their bouts in the same given night. Team Lakay pulled such a feat when all five of their combatants emerged victorious at the One Championship: Kings of Destiny event last night at the Mall of Asia Arena in Pasay City. In a lot of ways, Team Lakay's dominance last night was sweet, sweet redemption. If you can recall, sometime in 2013 and in the same arena, five Team Lakay fighters suffered brutal defeats. In the main event, Honorio Banario lost his belt via knockout to Koji Oishi of Japan. In the under card, Kevin Belingon, Rey Docyogen, Eduard Folayang, and Geje Eustaquio failed to get their hands raised. If you juxtapose this 2013 event with what transpired last night, you can see how far Team Lakay's fighters have traveled to sort of undo their defeats during that cursed night in 2013. "Ultimately, what defines you as a martial artist is how you mature from one fight to the next." As a mixed martial arts fan, this is a quote that stuck with me for the longest time. I can't accurately recall who said it (probably Chael Sonnen). I was reminded of this quote while watching Kings of Destiny last night with friends at a bar in Baguio City. The fighters of Team Lakay showed leaps of improvements. Like any fan of any sport, it's a joy to see fighters evolve every time they enter the cage. Kings of Destiny marked Eduard Folayang's first defense of his One Championship lightweight belt. 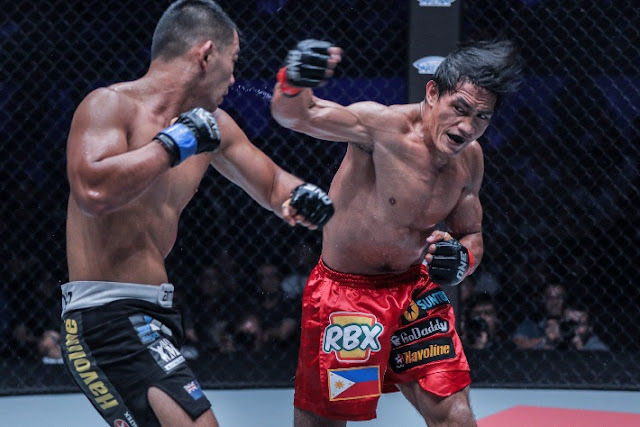 Ev Ting, the challenger, proved to be a worthy opponent but everything he did was nullified by Folayang's movement, takedown defense, and wrestling. In the co-main event, Kevin Belingon scored another highlight knockout win over Toni Tauro. And he did it in the very first round. Belingon started the fight a bit tentative but when he began connecting with his punches, a switch turned on and he went for the kill. The Silencer more than lived up to his nickname. Honorio Banario continues his resurgence with his 4th win in a row over Jaroslav Jartim. The fight was pretty even on the first round. In the second stanza, Banario unleashed a punch to Jartim's jaw that sent him unconscious to the canvas. Danny Kingad retained his undefeated record with a unanimous decision win over Muhammad Aiman. It was a back-and-forth fight but Kingad imposed his will whenever the fight went to the ground. Kingad escaped a nasty submission event in the third round and went on to secure the nod from the judges. The young prospect remains undefeated in five professional fights. And last but not the least, Gina Iniong made a successful One Championship debut with a win over Natalie Gonzales Hills. Albeit it was a unanimous decision victory, it's more than enough to send ripples in One Championship's women's division. See the full results of One Championship: Kings od Destiny here.